Christian Eriksen struck a late winner against Swansea City to move Tottenham within four points of the Premier League's top four. The Dane found space to fire low past Gerhard Tremmel as the game neared injury time at the Liberty Stadium. Earlier, the impressive Wilfried Bony had brought the hosts level with a stabbed shot, cancelling out Harry Kane's powerful first-half header. Spurs now sit seventh, two places and two points above the Swans. Mauricio Pochettino's Tottenham will now look at fixtures against Burnley and Leicester City either side of Christmas Day as games which could lift them into the Champions League qualification places. During a season in which Spurs have struggled to balance their Europa League progression with league commitments, victory took their tally to 12 points from a possible 24 in games after European excursions. Nine fresh faces from the midweek defeat by Besiktas helped deliver a hard-earned win. Swansea, without a win over the visitors in 32 years, will rue wasted chances and a sloppy start where Kane ended Tottenham's three-game goal drought. The 21-year-old headed home Eriksen's cross before ex-Swansea full-back Ben Davies - excellent throughout - denied Bony with a stunning last-ditch tackle. Bony, a player whom Swansea manager Garry Monk said will command an "astronomical fee" if he leaves in the January transfer window, tormented the Tottenham defence. Although he was denied early on by a smart Hugo Lloris save, he fired in from close range three minutes into the second half after his initial effort was blocked following Wayne Routledge's cross. Jonjo Shelvey and Jefferson Montero shot narrowly wide before Kane offered a warning with a glancing header. But Eriksen cut inside before shooting low to stand-in keeper Tremmel's right as Spurs secured a sixth win in seven Premier League games against Swansea. Swansea City manager Garry Monk: "It was a difficult start and we gave away a cheap goal but we started to create after that. There looked to be only one winner in the second half when we levelled and then there was the classic sucker-punch. "An individual mistake has ended up costing us. It's mesmerising how we didn't win that game. We didn't deserve that and we came away with no points from such a great effort." Tottenham manager Mauricio Pochettino: "We showed character, it was a difficult game because Swansea are a very good team. In the second half, they pushed us a little bit but we defended well and we were always alive in the game. "Harry Kane scored again, he's still young but he has potential and he needs time to play and work hard." Match ends, Swansea City 1, Tottenham Hotspur 2. Second Half ends, Swansea City 1, Tottenham Hotspur 2. Kyle Bartley (Swansea City) is shown the yellow card for a bad foul. Foul by Kyle Bartley (Swansea City). Jan Vertonghen (Tottenham Hotspur) wins a free kick in the defensive half. Jefferson Montero (Swansea City) wins a free kick in the attacking half. Foul by Ben Davies (Tottenham Hotspur). Corner, Tottenham Hotspur. Conceded by Gerhard Tremmel. Attempt saved. Harry Kane (Tottenham Hotspur) right footed shot from the centre of the box is saved in the bottom right corner. Goal! Swansea City 1, Tottenham Hotspur 2. Christian Eriksen (Tottenham Hotspur) right footed shot from the centre of the box to the bottom left corner. Assisted by Ben Davies. Attempt saved. Christian Eriksen (Tottenham Hotspur) right footed shot from outside the box is saved in the top left corner. Assisted by Benjamin Stambouli. Corner, Tottenham Hotspur. Conceded by Jefferson Montero. Substitution, Swansea City. Bafétimbi Gomis replaces Wilfried Bony. Substitution, Tottenham Hotspur. Nacer Chadli replaces Erik Lamela. Benjamin Stambouli (Tottenham Hotspur) is shown the yellow card for hand ball. Hand ball by Benjamin Stambouli (Tottenham Hotspur). Neil Taylor (Swansea City) is shown the yellow card for a bad foul. Foul by Neil Taylor (Swansea City). Kyle Walker (Tottenham Hotspur) wins a free kick on the right wing. Wayne Routledge (Swansea City) wins a free kick in the defensive half. Foul by Mousa Dembélé (Tottenham Hotspur). Attempt missed. Harry Kane (Tottenham Hotspur) header from the centre of the box is close, but misses to the left. 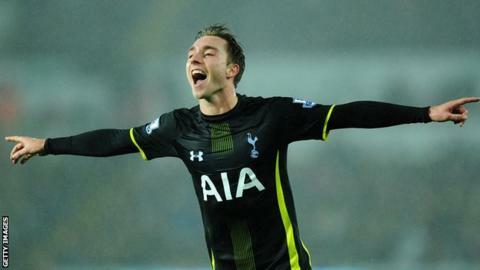 Assisted by Christian Eriksen with a cross following a corner. Corner, Tottenham Hotspur. Conceded by Wilfried Bony. Corner, Tottenham Hotspur. Conceded by Ashley Williams. Attempt blocked. Erik Lamela (Tottenham Hotspur) left footed shot from outside the box is blocked. Assisted by Benjamin Stambouli. Foul by Erik Lamela (Tottenham Hotspur). Foul by Ki Sung-Yueng (Swansea City). Nabil Bentaleb (Tottenham Hotspur) wins a free kick in the attacking half. Attempt missed. Ki Sung-Yueng (Swansea City) header from the centre of the box is close, but misses to the left. Assisted by Gylfi Sigurdsson with a cross following a corner. Corner, Swansea City. Conceded by Ben Davies. Attempt blocked. Ashley Williams (Swansea City) right footed shot from the centre of the box is blocked. Corner, Swansea City. Conceded by Harry Kane. Attempt blocked. Jefferson Montero (Swansea City) right footed shot from outside the box is blocked. Assisted by Jonjo Shelvey. Corner, Swansea City. Conceded by Jan Vertonghen. Attempt blocked. Jonjo Shelvey (Swansea City) left footed shot from the centre of the box is blocked. Assisted by Gylfi Sigurdsson with a through ball. Substitution, Swansea City. Ashley Richards replaces Angel Rangel. Offside, Swansea City. Gerhard Tremmel tries a through ball, but Wilfried Bony is caught offside. Substitution, Tottenham Hotspur. Benjamin Stambouli replaces Ryan Mason. Corner, Tottenham Hotspur. Conceded by Angel Rangel. How did Lawro get on this week?